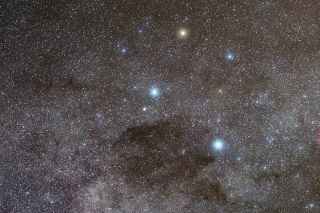 The four main stars of the Southern Cross (Crux) are Acrux (Alpha Crucis), bottom; Becrux (Beta Crucis), left; Gacrux (Gamma Crucis), top; and Delta Crucis, right. Beta Crucis (also called Becrux or Mimosa) is a bright star in the Southern Cross constellation, near Centaurus. Because of the star's southern orientation, it is best visible from the Southern Hemisphere. The possible multiple star system, 280 light-years from Earth, is the second-brightest visible star of the constellation, according to astronomer David Darling, following Acrux or Alpha Crucis. Becrux is at least a double star, with individual stars that are only eight sun-Earth distances, or astronomical units (AU), apart. This close distance — they orbit each other every five Earth years — makes it difficult to tell them apart, Darling said. With the naked eye, Becrux's brightness appears to be 2,000 times greater than that of our sun, Kaler said, but luminosity is even more when looking at all types of radiation: 19,600 times that of the sun. Beta Cephei variable stars, such as Becrux, tend to be 10 to 20 times more massive than the sun, said the American Association of Variable Star Observers (AAVSO). The star type tends to have temperatures of 20,000 to 30,000 K (about 35,540 to 53,540 F, or 19,725 to 29,730 C). Their periods of variability vary between 0.1 to 0.3 days, and the range of the variability isn't too much in optical wavelengths, although ultraviolet tends to exhibit more flux. Becrux itself is about 14 times the mass of the sun, Kaler said, and like the sun it is middle-aged; Becrux will be fusing hydrogen for about another 5.5 million years. Astronomers additionally noted a rotation period of eight days, and a metal content that is a little less than the sun, at about 75 percent. The main star Becrux may have several stellar companions, but the system will require more study before deciding this for sure, astronomers said. The star's spectrum implies there must be a "companion" that is about 7 AU away from Becrux, but astronomers haven't been able to spot it optically yet, Kaler said. Additionally, scientists also believe there may be a low-mass dwarf that is an astounding 3,600 AU away, taking 55,000 Earth years to make an orbit around its bigger neighbor. "The most interesting," of the companions, he wrote, "is a low-mass but active 'pre-main-sequence' star, a star that is still in the process of forming. Discovered through its X-ray radiation, it is quite invisible in the optical spectral domain. At a separation of at least 350 AU, it would take some 1,600 years to make a full orbit." This low-mass star was first detected by astronomers using the Chandra X-Ray Telescope. In the discovery, reported in 2008, the group noted that it was hard to spot because Becrux itself is so bright. "We also have detected ... an apparent companion to beta Cru at a projected separation of 4 arcsec [arcseconds]," wrote the group, led by Swarthmore College's David Cohen, on the prepublishing site Arxiv. "This companion was likely never seen in optical images because of the presumed very high contrast between it and beta Cru in the optical. However, the brightness contrast in the X-ray is only 3:1, which is consistent with the companion being an X-ray active low-mass pre-main-sequence star."